In February last year we presented 50 paintings of pretzels in a solo exhibition by the Munich based artist Ulrike Wenzel. One year later we are showing a further 50, never seen before ‘portraits’ of pretzels. To round things up there are some striking works illustrating the art history of the most favourite Bavarian snack. Ulrike Wenzel employs an almost ‘Sherlock Holmes’ like approach to detect her favourite subjects. Firm handed and with an experienced eye she finds those examples, which, let’s say, don’t fit into the common, obviously ideal expectations. Out of shape ones, burned ones, uber- or even not salted ones, pitiful thin or much to chunky ones are the objective of her detective hunt. Whenever she finds such an outlier again, she notes the date and place of purchase and captures the object of desire and documentation in oil on canvas, always on a panel in exactly 13 x 18 cm size. 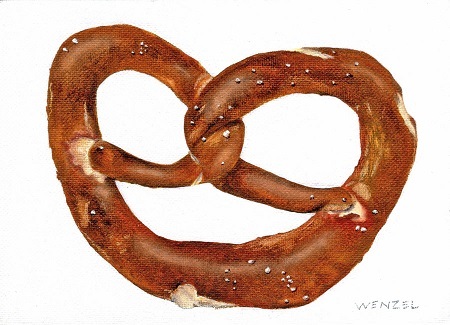 Thus, similar to a collection of rare insects or better a gallery of beauties, an elusive new collection von well over one hundred pretzel paintings accrued. We are presenting the very best 50 new ones. You are mistaken to believe that this exhibition serves a folkloristic cause. The underlying idea reveals a profound and subtle humour of the protagonist. Ulrike Wenzel will attend the opening of this exhibition on 4.02.2015 at 8 pm. You are cordially invited to the opening and show. All paintings are visible and available the very same evening on our webpage.